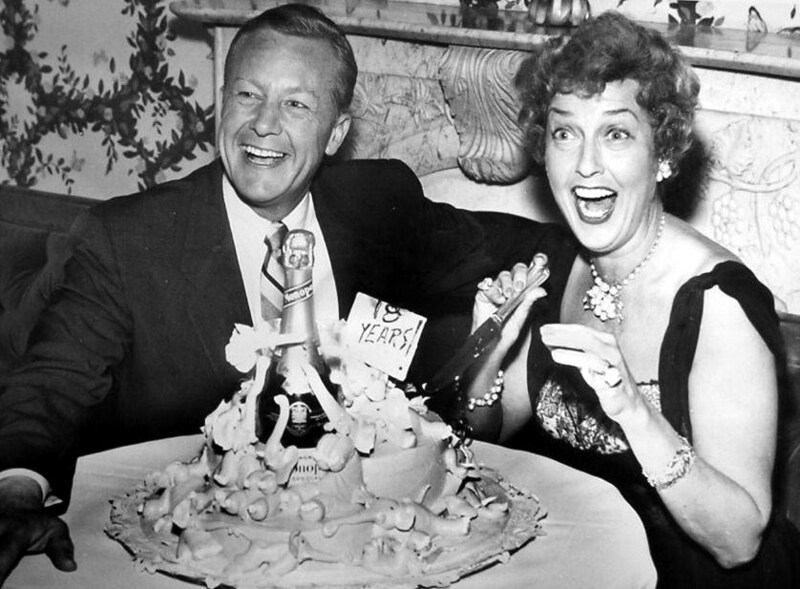 In 1937, Jeanette MacDonald shocked the world by marrying a Nelson Eddy lookalike, Gene Raymond. The public didn’t understand it then and we still don’t fully understand it today. But there is a lot of written documentation that helps us get a better grasp of what went on. This has come to the news forefront this year due to the selling off of the collection of the two women who ran Jeanette’s international fan club in the last few years of Jeanette’s life and until that group folded in recent years. The home shared by Clara Rhoades and Tessa Williams has been cleared out and the items are being sold. Of course among the items are letters from Gene to Jeanette and vice versa that show a familiar, fond or loving relationship. So let’s put this into perspective. They were married, after all, and Jeanette went into the marriage thinking (or hoping, according to her letters) that she had really made the right choice. And there were periods of time during their married life when she was disgusted with or estranged from Nelson Eddy and she leaned heavily on Gene for support and comfort. He was basically there for her all those years, in whatever manner, and he was a protection for her so that others would leave her alone. What we do know for sure about the Jeanette-Gene marriage is that they had a social group of friends, they had many staged photo ops at their home, looking very domestic and affectionate. And many other photos at parties, premieres and their yearly anniversary. One has to wonder why so many of these photo ops were shot by studio or professional photographers. Why was it so necessary to repeatedly show photographic evidence of their domestic bliss? Trying to make sense of a “Hollywood marriage” never works, believe me. I’m not sure many of them play by normal rules. And how can they? Actors are thrown together for love scenes, they go on location for months or on tour and there are many separations. Some marriages are based on agreements that the star will do what they do while working but don’t bring it home. When home, have a “normal” family and aim for domestic bliss. Whatever. The point is, movie stars aren’t just like us. They can’t be. Such massive stardom throws one into a fishbowl of scrutiny, there are people around you that are leeches and try to use you or capitalize on knowing you, etc. There’s usually only a small circle of people that can be trusted. We are aware that Gene Raymond did a cursory screening of what was sent to Clara and Tessa for safekeeping. They complained that he had tossed out a lot of stuff before sending the balance to them. And they themselves screened what they had. Being on the payroll (for life), they presented what was authorized. They were fully aware, for example, that Jeanette was born in 1903 but since the public was told 1907 – which she managed to have on her drivers license and other documentation such as her crypt- that was the date they would claim as accurate. There is a pattern with Jeanette and her relationships with her men. We can observe it starting with Bob Ritchie, her manager. They initially had a hot and heavy romance, he became her manager, they broke up a few times, reunited, then the relationship finally “changed” (Jeanette’s own word) within about 2 months of her meeting Nelson Eddy. Ritchie knew his romantic days were numbered when Jeanette called upon him to drive her all over California so she could attend Nelson’s concerts. But even then, Bob remained in the picture as her manager and her “guardsman.” That’s what she called him and that was a necessary role in her life. And guess what – his family said he was still in love with her and would have dropped everything and come back to her at any time had she given him the nod. In other words, Jeanette had two men that she was dangling at this period of time. 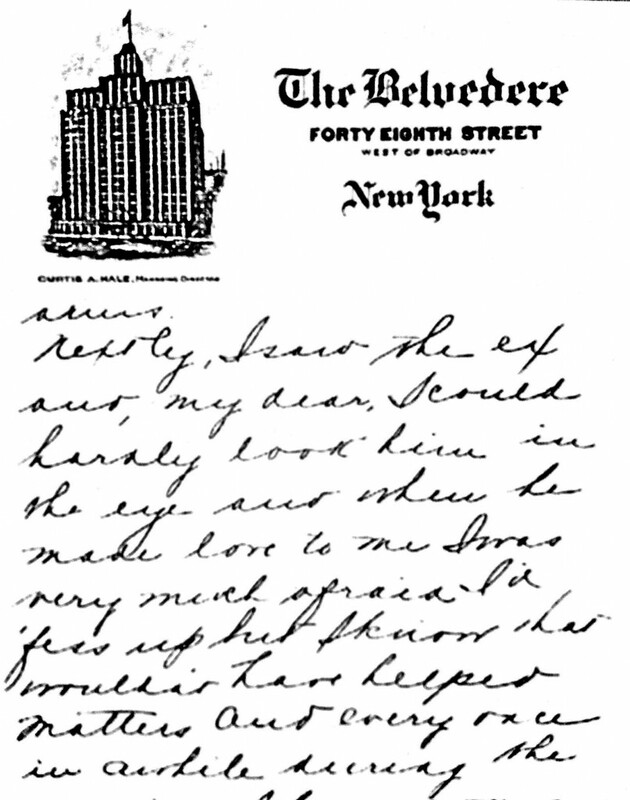 She was (eventually) honest about that in her letters to Irving but anyone reading these letters would assume she was head over heels with this guy, he was her one-and-only, etc. Below is beginning and end of a sample letter that demonstrates this. She starts the letter “My darling -” and the last page ends with “I am yours always, (Baby) Looks worse than it sounds. 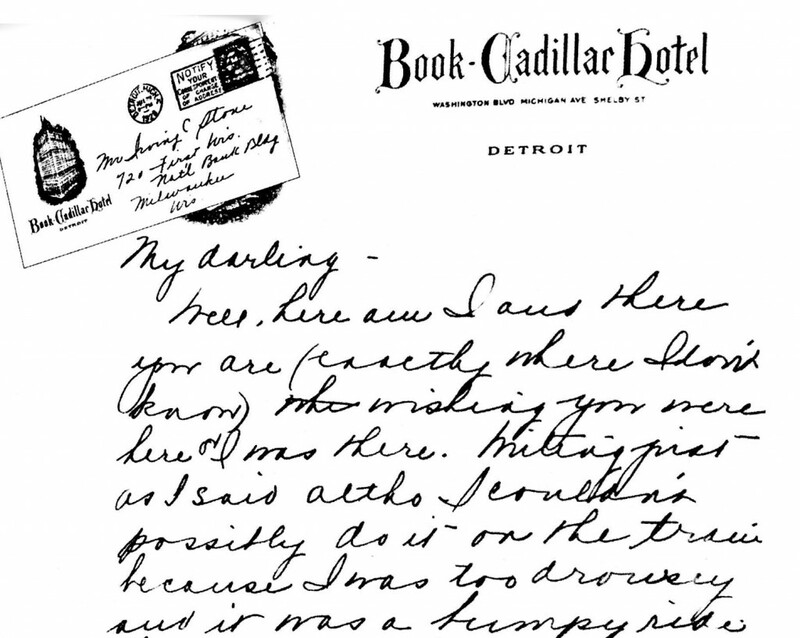 Jeanette” And in the letter she discusses a book she left in the hotel (presumably they were together?) and is reassuring him that if she writes him a short letter it doesn’t mean her love is on the wane. Irving Stone is another one who adored her long after the sexual relationship ended. And she continued to write him warm, loving, intimate letters over the years which helped him always feel he had a special place in her heart. And indeed he kept these letters all his life! The point of this commentary is to show that what was written in letters may not have shown the whole story. Jeanette had a knack for making her men feel important whether she was still intimate with them or not. She still cared for them and demonstrated that in her writing. And she was, after all, a very good actress. One for one, these men never truly got over her. Fast forward to June 1935 when Gene Raymond and Jeanette meet on the doorstep of a party. What was happening in her life? Just this, her romance with Nelson Eddy appeared to be irretrievably on the rocks. “I remember seeing Nelson for the first time and thinking he fulfilled most of my requirements in a man…” wrote Jeanette in her Autobiography. But the problems were simple and straightforward: Nelson wanted to get married immediately. He wanted a non-competitive wife and mother for his children. He didn’t want to play second fiddle to Jeanette’s career. He wanted his wife touring with him and at his side. And when Jeanette turned down his demands or asked if they could come to a compromise, stubborn Nelson refused. Translation: he understands why Jeanette is the way she is but if she really loved him, she’d drop everything for him. Nelson was a man with a temper and we can see his seething rage here. Enter Gene Raymond. And it’s easy to understand how Jeanette went for this “rebound relationship.” Because, as Jeanette later termed it, Gene appeared to be “like Nelson without the rough edges.” Yes indeed. There were enough similarities between the two men so that it made sense to Jeanette. 1. He looked a bit like Nelson. 2. He had a similar wretched childhood that had severely scarred him, a possessive mother and deadbeat father. Just like Nelson. 3. He was moody, like Nelson. 6. Once it started to get more serious, Jeanette gave Gene a dog, Tray. Just like she had given Nelson Sheba. 7. Gene didn’t want children which suited Jeanette just fine – at the moment. Total opposite of Nelson. But of course, then Jeanette wrote in her autobiography of how she came back from her honeymoon knowing that she and Gene would never have children. One is awestruck that she didn’t know more about Gene before she married him. 8. Same for her comments in the autobiography about how she had to learn to adjust to Gene after his marriage. She did not seem to know him all that well before. 9. Gene was 5 years younger than Jeanette – 7 years younger than Nelson. When Nelson and Jeanette had disagreements early on, he took up with others. One cannot doubt that wearing Gene on her arm was a subtle slap at Nelson. Gene was her boy toy and showed Nelson that she was desirable. 10. 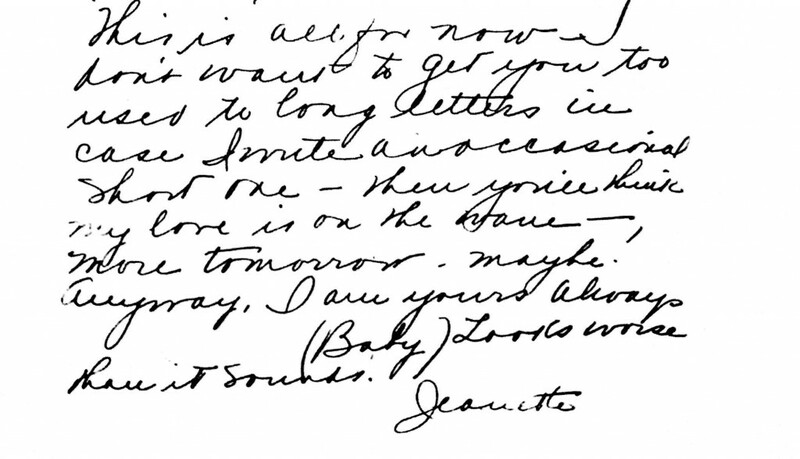 Jeanette notes in the autobiography that she and Gene didn’t become intimate until some time after she returned from filming at Lake Tahoe. The excuse given was her final showdown with Bob Ritchie, who came to Tahoe in the aftermath of her unhappy breakup with Nelson. (Bob Ritchie thought he stood a chance again to regain Jeanette’s affection but instead she turned to Gene.) Same as Nelson, it was many months after she met Gene that they took the relationship to the next step. But additionally, it’s interesting that she waited until there seemed no hope of reconciliation with Nelson before she took that next step with Gene. 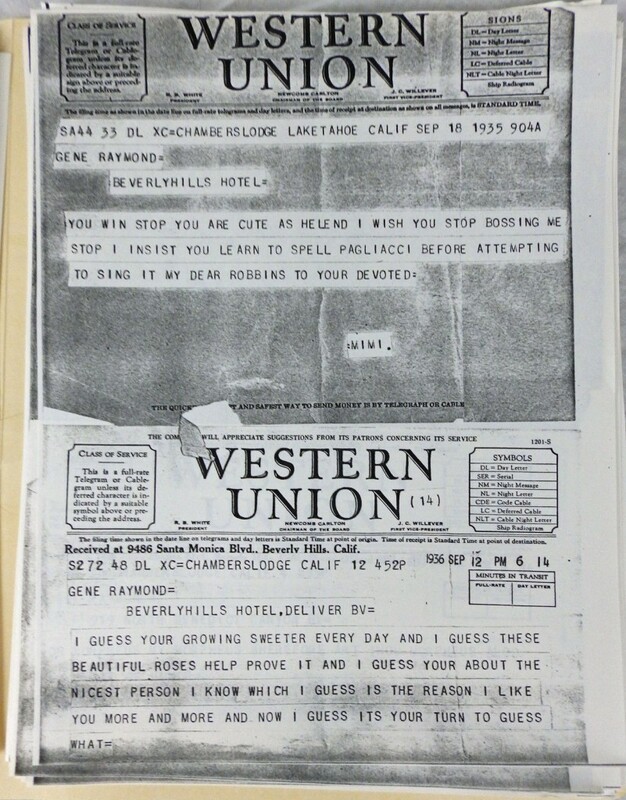 It is fascinating to look at these telegrams that were recently auctioned, to really see how in love or not Jeanette seemed to be with Gene early on. Whoa! Let’s look at this in context. She has been, since August 20, ENGAGED TO MARRY Gene Raymond. They have been engaged for less than a month and she “likes” him more and more? Was she actually alone at Tahoe? Did she go there to reflect about her life and the pivotal events that happened there the previous year? Was this yet ANOTHER failed attempt at a reunion with Nelson? Was he there with her? Returning to the place that briefly meant something special to them…as they would do in the coming years – return to Tahoe and Chambers Lodge? 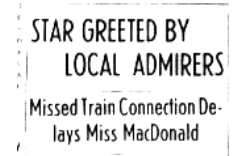 The previous month, August 1936, Jeanette had yet again a “final” breakup with Nelson. Which was followed by her mother’s announcement of Jeanette’s engagement to Gene. At the same time, Jeanette and Nelson began filming the “first” Maytime. Things were now very tense between them. And then the producer, Irving Thalberg, died. Production was shut down. We know that by October 7, Jeanette was in New York where Bob Ritchie’s best friend asked her if she was happy now that she was engaged to Gene. To his surprise, Jeanette broke down in unhappy tears! We learn now that Jeanette returned to Tahoe before making that trip to New York. And the question is, why and with whom? It certainly wasn’t Gene as the telegram was sent to him in Beverly Hills. Before the year was out, she and Nelson would reconcile again briefly- twice – while filming the second Maytime. In the next section of this article, I will discuss a few other written items which seem at first glance to, well, warrant a second glance. Let’s balance them against what Jeanette wrote in her Autobiography since she is surprisingly candid at how her marriage floundered after WWII. “On the surface, Gene and I were a contented, well-adjusted couple with most of the social graces,” Jeanette wrote. No wonder certain people (including Gene) never wanted that manuscript to be published.